Bumper JKBOSE Recruitment 2019 Announced for Graduates. Apply Online for 82 Jr. Assistant Posts. We have already told you that the Drought of Government Jobs that you experienced in 2018, will end in 2019 and the 2nd Day of 2019, has some awesome Employment News for you. 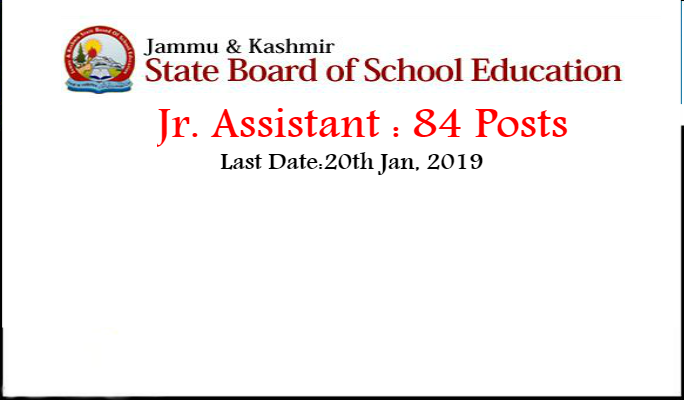 Jammu and Kashmir State Board of School Education has issued the Recruitment Notification and invites applications for 82 Jr. Assistant Posts. Remember this JKBOSE Recruitment 2019 is just a start and there will be Bumper vacancies in other Government Departments at Non-Gazetted and Gazetted cadre. 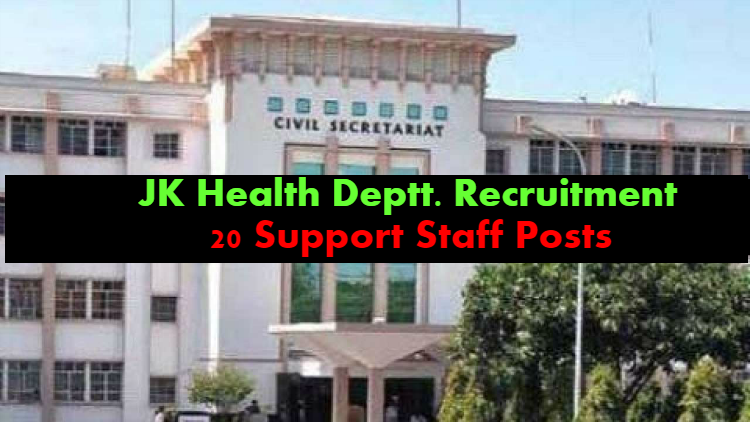 It is estimated that JKSSB alone will announce 10000 vacancies in this calendar years and For details, you should read our previous post on JKSSB Recruitment 2019. Not only, JKSSB, there will be bumper hiring in JKPSC and Police Department. J&K Police is expected to create at least 5000+ posts in 2019. So, all in all 2019 can be best year, as far Government Jobs in J&K is concerned. Now Lets talk about the JKBOSE Recruitment 2019. It is after a very long time, that JK BOSE has announced the Job Notification. We can remember that it was only in 2013 that J&K Bose has announced 77 Jr. Assistant posts. Now after a long wait of 6 years, we have another recruitment in J&K State Board of School Education. However this recruitment in JK BOSE shall be through SRO 202 of 2015 dated 30th June, 2015. Unlike previous years, where application process is through pen paper mode, this time, JK BOSE invites applications through online mode only and Registration shall remain open for a period of 15 days. In this post, we will discuss the complete details of JKBOSE Recruitment 2019. Applicants who are Graduates must apply for these Jobs in J&K State Board of School Education. You should read this post till the end and submit your application form before the closing date ie 20th Jan,2019. If you are a Class IV Job Seeker in J&K, then we have some surprising news for you. You might already be aware that in Sept, 2018, Govt. of J&K has discontinued the Interview for Class IVth posts. As per the existing rules, 20 Marks are allocated to Interviews for Recruitment of Class IVth Posts in J&K. Now, The Big news is that, All the Future Class IVth Recruitment's will be done by JKSSB and Selection criteria comprises of Written test only up to the level equivalent to the 10th standard, which means that Academic Qualification points for 10th and 12th Class cease to exist. In this post, we will discuss in the Detail the Complete process of Recruitment for Selection of Class IVth posts, Referral of vacancies and List of Departments that will create class IVth vacancies in 2019. 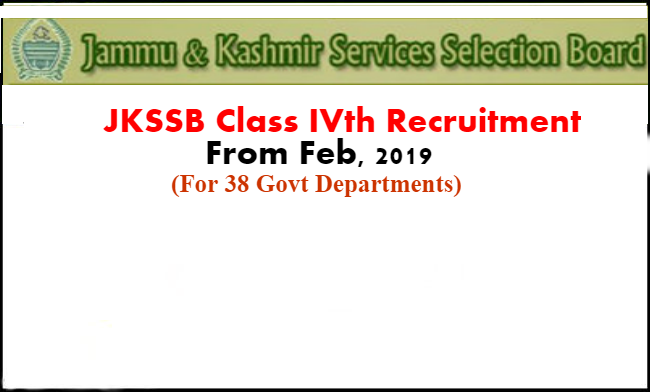 JKSSB to conduct the Recruitment for Class IVth Posts. There are 38 Government Departments in J&K, that until now are recruiting Class IVth Employee on their own. Now with new rules, all the vacancies in these departments will be referred to General Administration Department(GAD) under State/Divisional/District levels separately along with other details like roster points to the GAD for consolidation, which in turn again refer these vacancies to JKSSB for Advertisement and Recruitment. As per the Circular, Administrative Secretaries are asked to refer the vacancies to JKSSB by or before 31st January, 2019. If you are looking for Government Jobs in Power Development Department of Jammu and Kashmir, then we have some excellent news for you. 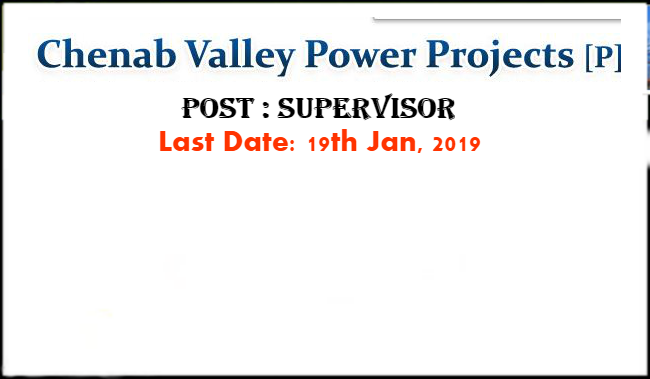 Today, Chenab Valley Power Projects has announced a full time Recruitment Notification for Supervisor Posts. It is pertinent to mention here that Chenab Valley Power Projects is a joint venture of NHPC, JKSPDC and PTC India Ltd. The Fresh Recruitment for Surveyor posts in Chenab valley is aimed at for execution of Pakal Dul, Kiru and Kwar Hydroelectric Projects in Chenab River Basin, Distt. Kishtwar (J&K) and for that company need Surveyor for various sites of the Project. Applicants should note that these are permanent posts with handsome salary and Selection process comprises of Written Test and Interview. It is not very often that Chenab valley announces the Recruitment Notification. It is after a very long time that Chenab valley has announced a Recruitment for Graduate Level Posts. Applicants willing to apply for these posts, should submit their applications forms through online mode till 19th Jan, 2019. Big News: JKSET 2019 Notification Soon. Keep checking this page for more Details. College and University Teacher Aspirants, we have some Big News for you. The much Awaited JKSET 2019 Exam Notification will be released soon. 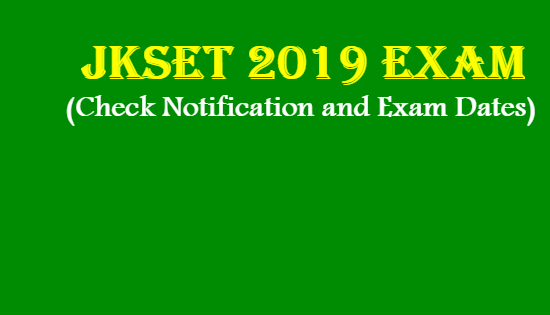 Though the University of Kashmir is already late in announcing the Notification, but we can expect it soon and chances are that Fresh JKSET 2019 Notification, will be based on the New Exam Pattern as we have for UGC NET Exam. If you have appeared in the UGC NET Dec 2018 Exam, then you should be aware of the latest pattern, and those who have not appeared in the exam are informed, that Latest Pattern has only 2 Paper (Paper-1 and Paper-2). There is No Paper-3 and it is merged with Paper-2. We will discuss more on this latest pattern in the later section of this article. JKSET stands for Jammu and Kashmir State Eligibility test, Just Like National Eligibility Test (NET) is conducted at All India Level, SET is for the state subjects of J&K only. Prior to 2010, Jammu University acts as a nodal agency for the conduct of SET Exam, but after 2012, University of Kashmir was made the Nodal agency to conduct the future SET Exam. First SET Exam was conducted by KU in 2013 and after that, there was No JKSET Exam in the Last 3 years. After Kashmir University, successfully conducts the First JKSET Exam, it approached UGC for the renewal of accreditation to University for the conduct of SET Exam and the Good news is that Kashmir University is granted permission to conduct 3 more SET's in three consecutive years. This means, there will be SET Exams in 2016, 2017-18 and 2019. Last Time Notification for JKSET 2016 Exam was announced on 30th Nov 2017 and Exam was successfully conducted on March 2018. After that SET 2017-18 Results were announced in July, 2018. About JKSET: JKSET is an Open Entrance test for determining the Eligibility for Assistant Professor posts for residents of J&K. ie. If you are willing to apply for Assistant Professor Jobs in State Universities and colleges, then, you should have Qualified either NET OR SET. JKSET will be conducted by JK SET agency on behalf of Kashmir University. JKSET will be conducted in 37 Subjects at various centres in Jammu and Srinagar. The Validity of SET Certificate is throughout the life. However, JKSET is valid only for Assistant Professor posts for Colleges and Universities situated in J&K only. To apply for Teaching Jobs in Colleges outside the state, you should have Qualified the UGC NET Exam. In this post we will discuss the complete details, you need to know to apply for JKSET 2019 Exam. Applicants willing to appear in this exam, must read this post till the end and also download the JKSET Broucher given at the end of this article. And all this Infrastructure Development in a way will create vacancies in the Department of Sports and Youth Services also Known as J&K State Sports council and Today, we have some great news for you with the announcement of J&K State Sports Recruitment 2019 for various posts. This is for the First time in the last 2 years,, that there is a Recruitment Notification by J&K State Sports Council Srinagar and this Recruitment Notification, is a welcome step to improve the sports culture in J&K. Though these are only Technical Posts, where only persons having Specialized Qualification / Experience can apply. Good news is there are 31 posts for Coaches for various sports discipline, that means, now there will be professional coaching for sports enthusiasts in J&K. Applicants must note that these posts came under the New Recruitment Policy 2015, where, you will be on probation for a period of 5 years and Salary during the period will be paid as basic only. 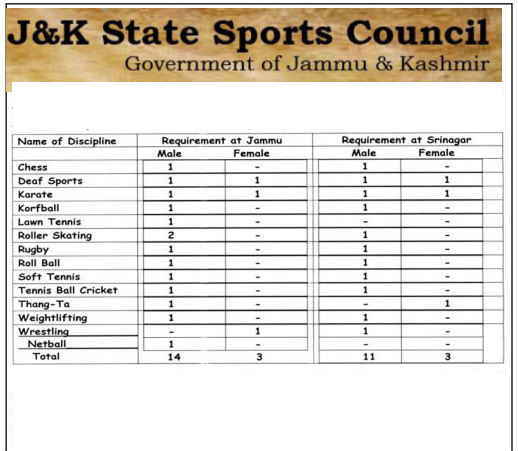 In this post, we will share the complete details of vacancies announced by the J&K State Sports Council. Aspirants are advised in their own interest, to read this Notification and thereafter apply for the same. It looks J&K Bank is on a hiring spree in J&K. In the month of October, J&K Bank has announced the Recruitment of 1450 Clerk and Officer posts, the response to that Advt was huge as more than 1 lakh candidates have applied for these posts and Now J&K bank has kick-started its Recruitment Project 2019 with the announcement of Faculty Posts for RSETI-Bandipora. It is a unique opportunity for those looking for Faculty Jobs in J&K Bank. It is not often that J&K Bank announces the Teaching posts, in fact these are specialized posts meant for Graduates and Post-Graduates of J&K. If you are Graduate Or Post-Graduate in the mentioned disciplines then you can apply for these posts in J&K Bank. 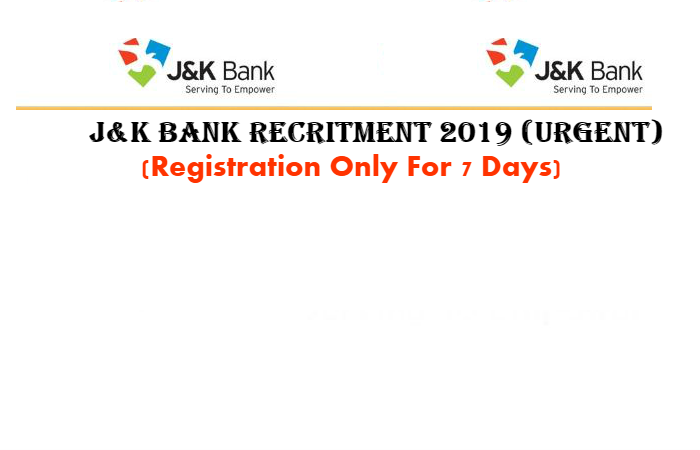 In this article we will discuss the complete details of J&K Bank Recruitment 2019. Applicants who have missed the previous J&K Bank Recruitment should apply for these Jobs in J&K Bank. Its raining Govt Jobs in J&K in December 2018. If you are a Govt Job Seeker then we have some Big News for you in this article. You might be a little bit disappointed with the way, things have gone in 2018. Yes, 2018, remains the worst year, as far Creation of Jobs in Govt Sector. The major Recruitment agency of J&K has advertised only 213 Posts, which is the big low if we compare Jobs created in Last 5 to 6 years. 2018 is going to end soon, and all we hope that 2019 will bring smiles on the faces of Unemployed youth of J&K. Good news has already started coming. In our previous post, we have discussed regarding the creation of 2000 Accounts Assistant Posts in the Panchayati Raj Departments and More importantly the Upcoming JKSSB Recruitment 2019 for 10000 Posts. All these Recruitments are expected to be notified in 2019. We have more Good News for you Today, as Mission Directorate ICDS (Integrated Child Development Services) has announced Three Recruitment Notifications on 22nd Dec, 2018. While the Advt No .1 and Advt No.2 has slightly less posts but the ICDS Advt No. 03 of 2018 has Bumper Posts ie 282 Posts have been announced by J&K ICDS at the Block Level. 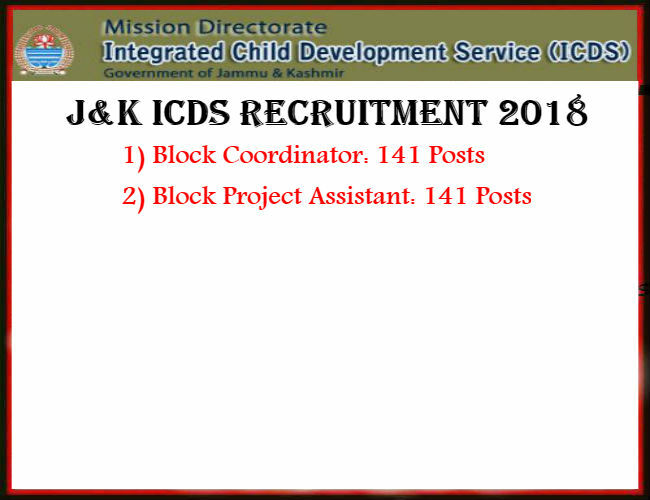 In this post, we will discuss the complete Details of J&K ICDS Recruitment 2018 for various posts. Applicants willing to apply for these posts should submit their application forms before the closing date after going through the Eligibility criteria meant for these posts. If you are Unemployed, sitting idle at home, but still want a Government Job, then this post needs your Attention, as here we will discuss regarding the Latest Openings in the Governemnt Sector. If you remember in our previous posts we have shared the Information regarding 98 Jobs in Social Welfare Department and 59 Posts in J&K State Child Protection Society, you should read these articles. Now, Lets talk about the Govt Jobs, announced Today. Not a Bumper Recruitment, still 20 Posts of Support Staff (MultiPurpose Workers) is advertised by Government Medical College Srinagar. The vacancies are actually announced by the Institute of Mental Health and Neuro Sciences ( Govt Psychiatric Diseases Hospital, GMC Srinagar). Recruitment for these 20 Multipurpose Worker posts in GMC Srinagar shall be done under Scheme -A of (National Mental Health Program) initially for a period of 1year on till the scheme in action. Looking for Governemnt Jobs in J&K? Apply Now for Officer and Manager Level Posts in Social Welfare Department. 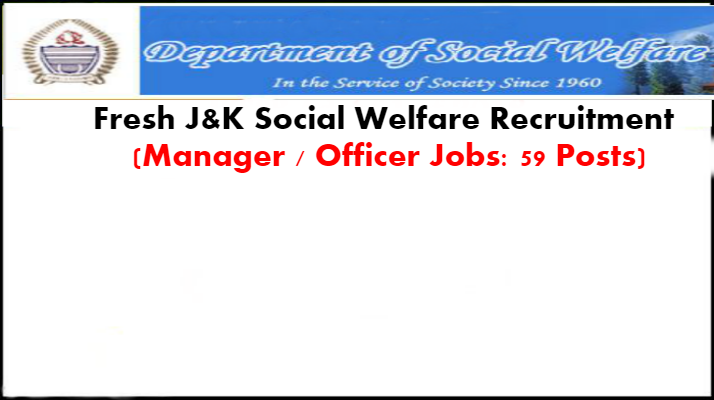 It looks Social Welfare Department of J&K is on a hiring spree. 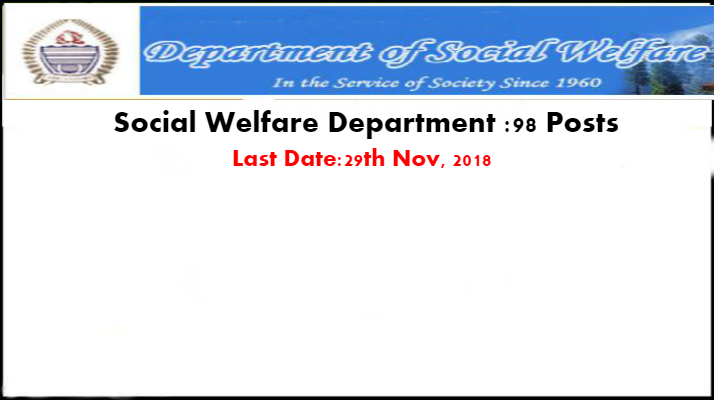 Only Three Days, back, Department of Social Welfare has announced the Recruitment Notification for 98 Posts and Today there is another Notification for 59 Fresh Posts in the Social Welfare Department. These posts have been advertised under the J&K State Child Protection Protection Society on the Contractual basis with Consolidate Salary per month. While the previous J&K Social Welfare Recruitment has posts for Simple Graduates, this Recruitment has the vacancy for Specialized Graduates. As per the Official Notification, Submission of Application forms will start from 6th Nov 2018 and the Last Date to apply is 27th Nov 2018. Unfortunately, there is No Online forms for these posts and as such you have to Submit the Prescribed Application form at the Official Address of the Department. As far as Posts are concerned, various Job Profiles are needed, requiring Specialized Qualification in the respective Discipline. Applicants should note that these posts are not under the Domain of Govt, rather under a Scheme and as such Positions are temporary, and therefore, you can not claim for permanent absorption in the Social Welfare Department. Applicants willing to apply for J&K state Child Protection Society, should read this post till end and submit the application form before the closing date ie 27th Nov 2018. 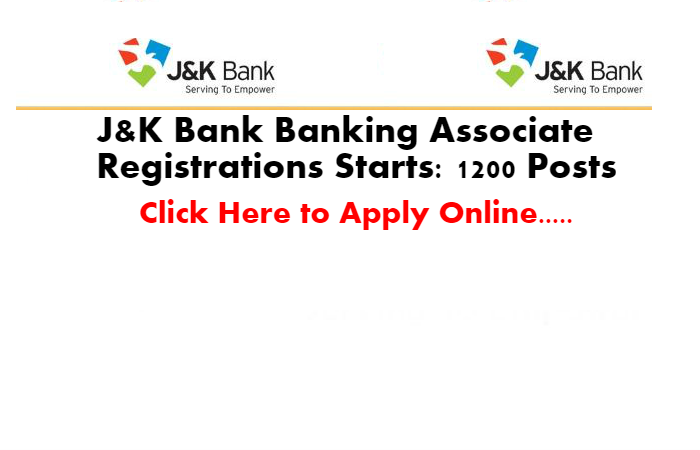 If you are reading this post, then chances are that you have applied for J&K Bank Recruitment 2018 for PO and Banking Associates Posts and preparing for the exam. But before we discuss the preparation strategy and Books for J&K Bank exam, you should have hands on the J&K Bank Syllabus and aware of the Topics that comprises the Syllabus for Banking Associate and PO Posts. The best part of the J&K Bank Recruitment that there is a Similarity in Syllabus for PO and Banking Associates posts. There will be Single Exam for Banking Associates posts, while the PO Exam will have 2 stages (Pre and Mains). Now, Let's Talk about the similarity in Syllabus. There is the same Syllabus for Banking Associates and PO Prelims Exams. Both of these Exams will have the same No. of Questions, Time Duration, Topics and even same Examination structure. 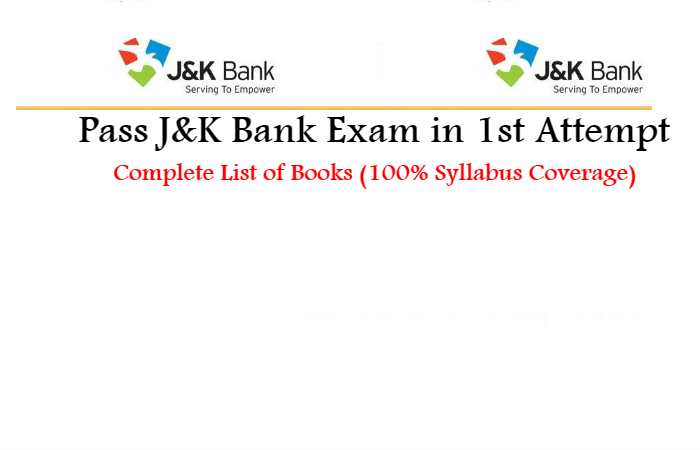 Here is the Common Syllabus for J&K Bank PO (Prelims) and Banking Associate Exam. In this article, we will discuss regarding the Most Trusted and Bestselling Books for the Preparation of J&K Bank Exam. We will also discuss why you should Buy these Books and Prefer Self Study rather spending Thousands on Coaching. 1) These Books are written by Experienced authors and Published by Well Known Publishers. 2) These Books are recommended by the Toppers of Previous Bank Exams Toppers. 3) These Books cover 100% of the Syllabus, Even Test Papers and Practice Papers are included to check your preparation. 4) Shortcut Tricks given in the Books to help you Solve Complex Mathematical Problems in Quick Time. 5) Last But not the Least, you can Buy these Books Online at India's Largest Shopping Websites ie Amazon and Flipkart at Discounted Rates and that too with Free and Fast Delivery. Subject Wise Books for J&K Bank PO and Banking Associate Exam. Looking for Govt Jobs in J&K? Apply Now for 98 various Posts in the Social Welfare Department of J&K. 2018 was not a Big year as far as Fresh recruitments in J&K is concerned. The major Relief was provided by J&K Bank when it announced 1450 Officers and Clerk Posts. The online Registrations for J&K Bank Recruitment are still going on. If you have not yet applied for Jobs in J&K Bank, then read our previous post in which we have discussed in Detail, regarding the J&K Bank Recruitment 2018. Today, the Social Welfare Department of J&K has announced the Contractual Recruitment Notification for 98 various posts under the Integrated Child Protection Scheme (ICPS) on Contractual basis initially for a Period of 1 year. Applicants should note that Recruitment of these posts in the Social Welfare Department does not entitle you for permanent absorption in the Government Department, rather the recruitment is made under a Scheme and as such candidates will have to execute an undertaking in the favour of Mission Director ICPS attested by Judicial Magistrate that the appointment shall not claim for permanent regularization in the State Government. If you are willing to apply for these contractual positions in Social Welfare Department of J&K,then you should read this post till the end and submit the application form before the closing date ie 29th Nov, 2018. Need Govt Jobs in J&K? Either Pay Bribe or have Strong Political Connections. If you are a permanent resident of Jammu and Kashmir and Believes that Merit is the only way to secure a Government Job, then Today, we have some Disturbing and Shocking News for you and the Best is that is the News is Verified by none other than the Head of Jammu and Kashmir ie His Excellency "The Governor of J&K"
The News First Broke Out on Sunday (28th Oct 2018), When Malik Sahab was Frankly Speaking with Navika Kumar of Times-News. This sensational, but to the point Interview raised concerns on the highness of Corruption in J&K and Raised Big Question Marks on the Recruitment Policy of J&K. In that Explosive Interview Governor Sahab, Exposed, Politicians, Beuorocrats and Recruitment Agencies. Here you will get to Know How Politician adjusted their Friends and Relatives in the J&K Bank. If you are not aware of this News then we shall cover each and Every part of the Story in this Article. If you are applying or have applied for J&K Bank Recruitment 2018, then this post needs your attention as the Main focus of the Article will be on "Recruitment SCAM in J&K Bank in 2015". 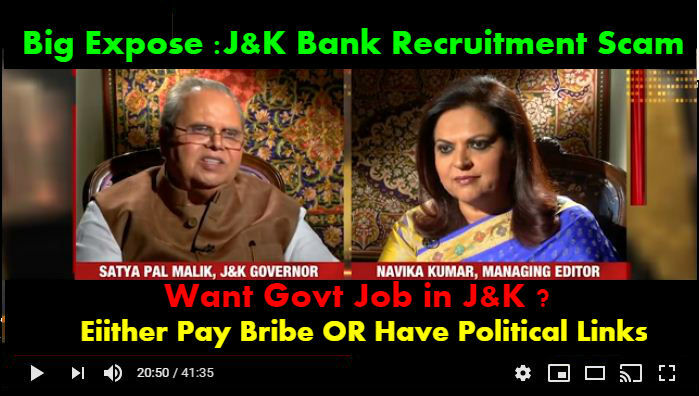 On Sunday (30th Oct 2018), J&K Governor, appeared on a Times Now show with Navika Kumar, where he Exposed the J&K Bank Recruitment Scam. Here Governor Sahab Clearly says, that " J&K Bank appointed Relatives and Workers of Political Parties instead of Deserving Candidates. J&K Bank Aspirants, Today, we have some Big News for you. The much-awaited Online Registration for J&K Bank Recruitment 2018 has started. The Registration window shall remain open for 17 to 18 Days. However, we strongly suggest that you should apply as soon as possible, to prevent any Last minute delays. As of Now, Registration has started only for J&K Bank PO Posts, while Registration for Banking Associates will start from 24th Oct 2018 Onwards. In this post, we will discuss the step by step process for submitting the J&K Bank Online Application form. Applicants willing to apply for Officer and Clerical Jobs in J&K Bank, should read this post till end and submit their application forms before the closing date ie 20th Oct, 2018. Why to Apply Early for J&K Bank Recruitment? 1) Applicants applying Early might get the Desired Examination Center. 2) You will not be Troubled with Last Minute Delays Like Website Not Responding, Server Overloaded, Failure Transaction etc. 3) You will get ample of time to make corrections in the application form, in case you submitted incorrect details. With all the above-given reason, make sure that you apply for J&K Bank Recruitment in starting Days, and not wait for the end Dates. 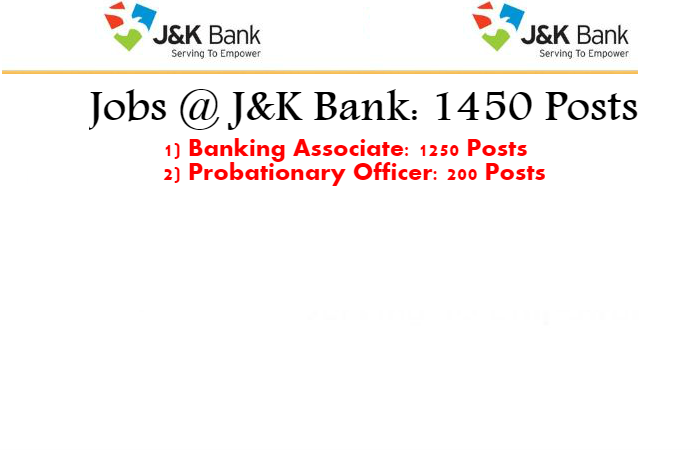 J&K Bank announced 1450 Posts on district Cadre Basis. Apply Online from 20th Oct 2018 Onwards. Update: The Big News is Here. Much Awaited J&K Bank Recruitment 2018 Announced for 1450 Posts. Apply Online from 20th October 2018 Onwards. If you are looking for Banking Jobs in J&K, then J&K Bank should be on top of your Priority List, as it the Largest bank in J&K, and is considered the Third Largest Job creator in J&K next only to JKSSB and JKPSC. Unlike IBPS, that conducts the Recruitment Exams for 23 Public Sector Banks in India, J&K Bank does the hiring on its own as it is not the participating bank in the IBPS Common Written Exams. So, if you are willing to apply for J&K Bank Recruitment 2018, then you have to apply at the J&K Bank's Website only. J&K Bank's Human Resource Development Department is silent from the Last few years as far as recruitments are concerned. Last time, J&K Bank announced the Bumper Recruitment for Relationship Executive posts in 2015 and since then there is No major Recruitment Drive by J&K Bank. But 2018 Recruitment is a Big News for those awaiting for Jobs in Jammu and Kashmir Bank. Moreover, Recruitment results announced by J&K Bank is last few years, have drawn much flak and are considered to be biased. The worst part of JK Bank Recruitment is that there is No Transparency neither in the Notification nor in the selection lists. 1) There is No mention of Exam Dates and Exact No of vacancies. 2) No explanation on, how the Selection process works. 3) No cut off Marks announced. However, this is not a topic for this post and here we will discuss only the J&K Bank Recruitment 2018 for 1450 Posts. In this post, we will discuss the vacancies that J&K Bank has announced in 2018 and future recruitments in 2019. However exact Dates, Notification and other details, will be known only when the Recruitment Notification will be announced by JK Bank. 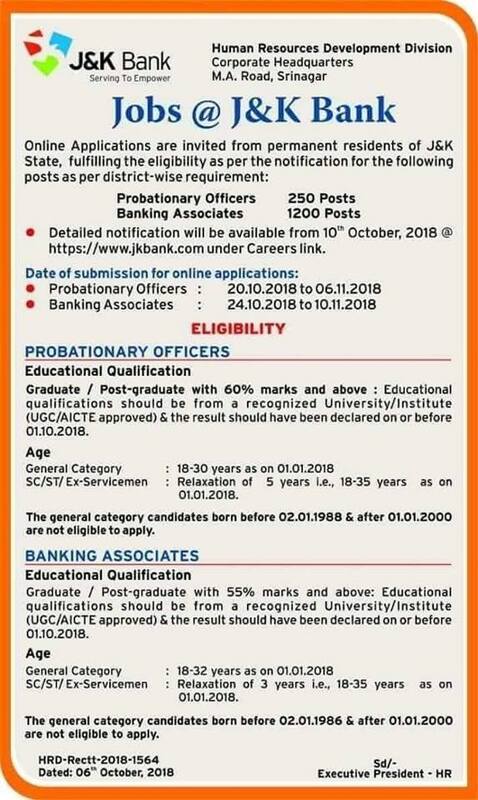 On 6th Oct 2018, J&K Bank has announced the much-awaited Recruitment for Clerical and Officer Level Posts, thereby ending the long wait of Banking Aspirants in J&K. The Best part of this Combined Recruitment is that it has vacancies both for Officers as well as Clerks. As per the Short Advertisement, announced by the bank, Detailed Notification and Online Registration, will start from 10th Oct 2018. 4) Date of Online Registration for Banking Associate: 24th Oct to 10th Nov, 2018.
Who can apply for these Posts? (I) For Probationary Officers: Applicants willing to apply for PO Posts in J&K Bank, must full fill the below-mentioned eligibility criteria. Age Limit: Applicant must have attained the age of 18 years and maximum age should not exceed 30 years. However, there is a relaxation of 5 years for SC/ST/EX-Serviceman. Educational Qualifications: Applicant should be a Graduate / Post-Graduate having obtained not less than 60% from a recognized University in India. (II) For Banking Associate: Applicants willing to apply for Banking Associate Posts in J&K, must have the following eligibility conditions. Education Qualifications: Applicant should have completed Graduation / Post-Graduation with minimum 55% Marks from a recognized Indian University. The Selection process for the recruitment in PO's and BA's in J&K Bank comprises of Written Exam and Interview. Written Exam: All those candidates who apply for J&K Bank Jobs, will have to appear in the Written Exam to be conducted through online mode. Though J&K Bank has not yet announced the Syllabus and Exam Pattern, it is expected that J&K Bank Syllabus will be the same as we have for RE Recruitment in 2015. Interview: Those who Qualify the Written Exam, will be called for the Interview. Final Selection: The Final Selection comprises of Candidates performance in the Written Test and Interview taken together. Applicants willing to apply for these posts should submit their applications through online mode only. Online Applications: Applicants need to Submit their Application form, through online mode only by loging on to the Official Website of J&K Bank. Details: For Complete Details, applicants are advised to check the Official Website of J&K from 10th Oct, 2018 Onwards. For providing Banking Facilities at Doorstep to the people of Leh District, J&K Bank has launched an ambitious Project to open Ultra Small Branches in every Village of Leh, for effective Finacial Inclusion program and this noble Initiative creates Exclusive Recruitment for the Residents of Leh-Ladakh Region, particularly the youth of Ladakh Regions. It is very rare that we see such exclusive Recruitment for this region and this step of J&K Bank, will help a long way in Confidence Building Measures. IF you are aware of the 2154 Teacher Posts that were announced by JKSSB in Dec 2017. In this recruitment, there were no posts announced for Ladakh Region, while Kashmir Division got a Whopping 86% Share and Jammu got only 14% Share in the vacancies. Now all we hope that the Next JKSSB Recruitment, will do Justice with these two regions, that were ignored previously. No. of Vacancies: J&K Bank has not notified the vacancies for these posts. Note: Initially Recruitment for these posts in Contractual in Nature, and period of Contract in 6 months. Permanent absorption will depend upon candidates performance in the Contractual period. Eligibility Criteria: Who can apply? Domicile: Applicant should be a permanent Resident of Leh-Ladakh Division. ii) Education Qualifications: Candidate should have completed Degree in any Discipline from a Recognized University in India. ii) Education Qualifications: Minimum Qualification is 10th, While Maximum qualification is 12th Pass. Online Applications: Applications are to be submitted through online mode only. Applicants need to visit the J&K Bank Website (www.jkbank.net) and submit the form by following the Instructions, as given.